In this week’s blog, I refer to: Housing, Sir Michael Lyons, the Public Finance magazine, Winston Churchill, Harold Macmillan, Harold Wilson, the Scottish Government, Impact Housing Association, the Riverside Group, the Cumberland News, Homes England, Appleby Heritage Action Zone, Historic England, Seminars and Training. This is a bit of a milestone because it is my 100th blog! In 1951, Winston Churchill was returned to power at the head of a Conservative administration. His manifesto had stated that ensuring that everyone was adequately housed was a priority for the government second only to national defence. Harold Macmillan became minister of Housing and launched an ambitious programme of council housing that peaked in the 1960s under Harold Wilson’s Labour government. 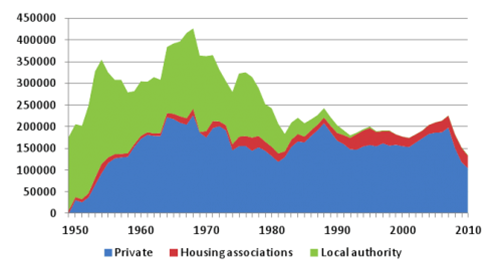 A glance at the graph below shows that it was only during this period of significant council house building (shown in green) that Britain has ever built enough homes. My conclusion is that if Britain is ever to build enough homes again, there is a need for a more substantial building programme by local authorities as well as housing associations. The increasing divergence between public policy in England, Northern Ireland, Scotland and Wales is interesting to follow. I have written previously in this blog about the planned takeover of Impact Housing Association by the Riverside Group. Along with others, I have expressed concern about the secrecy with which the process is being conducted and the lack of engagement with the shareholding members of Impact (of which I am one), Impact’s tenants and the communities in which Impact works. Last Thursday, Impact finally agreed to meet with shareholding members for two briefing meetings – one in Workington and the other in Penrith. I attended the meeting in Penrith and despite being disturbed about some aspects of it, found it interesting on many levels. However, at the end of the meeting shareholding members were told to keep all the information that had been discussed secret and consequences were threatened for anyone who did not! I found this disappointing as some interesting information had come to light, not least about Impact’s finances, and Riverside’s intentions for the future of services such as the Salterbeck Oval (a community centre) and the Young People’s Foyers at Kendal, Penrith and Whitehaven. I think Impact should make this information public; and would have liked to have discussed it with readers of this blog, Impact tenants and other stakeholders. I would be interested to know how Impact reconciles this secretive approach with the letter that Mark Costello, the current Chair, wrote in the ‘Cumberland News’ last week that was headed: ‘Secrecy accusations unfounded and unhelpful’. In this blog and in my letter to the ‘Cumberland News’ last week I urged tenants to apply to become shareholding members of Impact so that they could have a vote on Impact’s future. Impact Housing Association has always encouraged tenants to become members and I understand that over the last few weeks, several tenants have applied to join. However, Impact has abandoned this policy of many years and is now refusing membership to any new applicants including tenants. Impact have confirmed that there will be no tenant ballot. Instead there will only be an advisory consultation that the board will be free to ignore. Based on the Penrith meeting, it also appears to me that there has been a change in the ‘culture’ of Impact. When I first joined Impact and when I was Chair we welcomed different points of view and, even when people had serious disagreements, any discussion was conducted in an environment of mutual respect. However, it now appears to me that the board, management team and their consultants are not interested in other people’s opinions; and people who are concerned about the current direction of Impact or who would like more information are treated with disdain. I think that this situation represents an abandonment of Impact’s values and Impact’s tenants by the board. And remember that this is the ‘rump’ of the board. There are twelve seats on Impact’s board but only five members are still in place. And, according to the regulator, Homes England, when they reported their in-depth assessment in 2017, the board have not been conducting themselves with “an appropriate degree of skill, diligence, effectiveness, prudence and foresight” and were therefore downgraded to an unacceptable level by the regulator. But, surprisingly to me, they continue in office! Last Thursday I also attended the inaugural meeting of the Appleby Heritage Action Zone committee. This is made up of local people with an interest in heritage of whom I am one. The conservation area in Appleby has been chosen as one of the country’s first Heritage Action Zones - the only one in Northwest England. Historic England is the driving force behind this nationwide initiative, that will breathe new life into areas that are rich in uncelebrated heritage. The objective is to use heritage to improve well-being and generate economic development. Other heritage action zones are in Coventry, Elsecar, Hull, King's Lynn, Nottingham, Ramsgate, Sunderland, Sutton and Weston-Super-Mare.